How interesting that you saw the book like that; it’s probably a very helpful way to think about the book since, as you say, it’s not a mystery in the traditional sense of it. Still, I got lost in the characters and found it a compelling read. I actually mention it in my own latest blog post – coincidence, isn’t it? .-= Margot Kinberg´s last blog ..Identity Crisis =-. I think so much of my experience was based on my reading mood during the several weeks it took me to get through this book. As you say, it’s not a mystery in the traditional sense, and I think if I’d been able to get out of that “in the mood for a mystery” I would have enjoyed it much more. It is quite the coincidence, too, that we both posted about the book at the same time! .-= Bernadette in Australia´s last blog ..Review: Sworn to Silence by Linda Castillo =-. So glad to hear I’m not the only one! I know it’s garnered a lot of praise, and probably deservedly so – it just wasn’t suiting my mystery mood. It took me a while to get down to writing this review – I finished the book back in October – and it was because I needed to figure out exactly what threw me off! The writing is very good, much like in In The Woods, so it was quite a puzzle at first why I didn’t enjoy it as much as I had her first book. But if you’re in the mood for a more literary, psychological character study, this would make a good read. I am intrigued by this line in particular: “I also tend to favor more of a clear line between good and evil in the mysteries I read.” That’s so interesting! Because usually one prefers complex characters, but it may be that part of the appeal of mysteries is more clarity so that the reader can jump into the game and try to solve it. .-= rhapsodyinbooks´s last blog ..Winners of “A Dog Among Diplomats” by J.F. Englert =-. Good point, Jill – thanks for catching that. I definitely wasn’t expressing what I meant very well. I actually do prefer complex characters in a mystery as well – it’s why I feel there’s a time and place for the “cozy” but usually, I like the deeper, more intricate mysteries. I’ve gone back and revised the review so that the sentence now reads: “I also tend to favor more of a clear line between good and evil in the mysteries I read, so that, at some point during the narrative, there is a specific intent to cause serious harm to someone else.” This specific intent to harm is something I do expect in a mystery, and that’s what I really meant when I said I enjoyed a clearer line between good and evil in my mysteries. It’s funny how we often have expectations going in to a book. I’ve been surprised a few times – sometimes for the good and sometimes not. I haven’t read this author yet, I’ll have to check out the first one at the very least! .-= Jemi Fraser´s last blog ..The First Spark =-. I really enjoyed the first one (although be prepared that the ending isn’t wholly satisfactory, as one important part of the book remains unresolved). If you do get a chance to read it, I’d love to hear your thoughts about it! Is it OK that I only read the first and last sentences of this post? – I really hope to read this book and usually skip reviews when I have the book in house. Not that I will get around to it soon. Anyway. I was here. .-= Care´s last blog ..Books in My Future =-. I’ve got In the Woods to read. I think my reaction to it will help me decide if I read The Likeness. I’ll keep your review in mind if I do decide to read it. I think you’ll like In the Woods, Kathy. And I think if you don’t look at The Likeness as being a traditional suspense/mystery, you’ll probably really enjoy The Likeness, too! Great review — and sometimes expectations and preconceived ideas do color my take on a book. I need to read In the Woods first. I really enjoyed In The Woods. I raced through that novel, and the camaraderie between Cassie and Rob was really enjoyable. I think you’ll like it (except maybe the ending, because one thing does remain unresolved). I’m super interested in Tana French — I think I’m going to add Into The Woods to my wishlist! I’ve seen several reviews lately and had forgotten how much I once wanted to read it, haha… I like a clear line between hero and villain in my books, too, so I imagine I’d share your feelings about The Likeness. I’ll start with the first one and see how I feel after that! Great, honest review! .-= Meg´s last blog ..Book review: ‘The House On Tradd Street’ by Karen White =-. Thanks, Meg! I really enjoyed In The Woods and would love to hear what you think of it. I was disappointed a bit with the ending, but when I think back to the book, what I remember most is the way French depicted the relationship between Cassie and Rob. That’s a great distinction to make. I though that French corrected a lot of what I thought were her weaker points from In The Woods in The Likeness, and even though it was just as long, if not longer, I thought it was a much tighter book. But I did love the story and the characters in The Likeness. I liked the non-traditional mystery as well. I know I would have enjoyed it a lot more if I stopped thinking of it as a mystery. But even though I wasn’t in the right mood for this one, I will definitely be reading more of French’s work – she writes so well. I think that’s why I ended up liking this one way more than In the Woods…there was no mystery. For me, it was more of a psychological/mind games type of book. And I love the fact that Cassie got caught up in everyone’s lives, despite the fact that she was investigating them. .-= softdrink´s last blog ..Tell Me Something True =-. The one good thing is, I’ll be making sure I’m in a different reading mood when I pick up whatever book French publishes next. I do enjoy her writing, and if I’d been in a different reading mood, this one would have gone over much better for me. I’ve encountered this problem with other books. It’s frustrating, and shifting from one perspective to the other can be quite a mental workout. I’m sorry to hear this wasn’t quite what you expected! I’ve had the same happen to me before. But the way you described it made it sound like something for me – especially the ambiguity. .-= Nymeth´s last blog ..Asleep by Banana Yoshimoto =-. 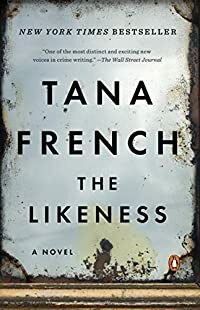 Nice to find a discussion of Tana French. I happened upon In The Woods quite by accident and absolutely fell in love with the writer. I do not think I have ever been so enamored with anyone’s writing in the way I responded to hers. The descriptive words that she used and the ways in which she used them gave a rush to all of my senses. I found myself not being able to imagine how she had the talent to put together such lyrical combinations of ordinary and unexpected words which painted such brilliant pictures for the reader. I was searching for a book that would not let me put it down and I surely found it. Most often I find that a good mystery plot even with a very simple writing style can hold my attention and keep me in one spot until I finish it. However, it only satisfies part of my yearning for a good read. Or sometimes a writer will drift off into such “space filling” descriptions that are flat and colorless and very often have absolutely nothing to do with anything that I cannot make myself trudge through the work no matter how good the plot seems to be. I find that to be a sad waste. However, with French I feel as if I have been intrigued enough to keep me wanting more, and entertained and fulfilled as if I have also been to the museum, the ballet and the symphony along the way—and perhaps even a philosophy lecture in reading The Likeness, as I found myself pulling some quotes from her second book. I could not wait to read The Likeness and was almost as pleased as with the first book. I did not enjoy the mystery quite as much, but realized that she could probably write about anything and I would still feel the same way about her as an author. I also tore through that work until I got to the end and found myself only wanting to read a page a day since I knew it was her last novel. I even found a website where I could post a plea for her to continue her writing. My conflicts being fearful that her work might become mechanized and not hold the same level of mastery vs. my longing to continue experiencing her writing. I am excitedly awaiting Faithful Place. I too was simply pulled into it.